Over 370 experts applied to this call which closed on 11 February 2019 23:59 hrs CET (Brussels time). The Focus Group experts will be selected in April. For more information on EIP-AGRI Focus Groups and their tasks, please see the Focus Group brochure and EIP-AGRI Focus Group Charter. 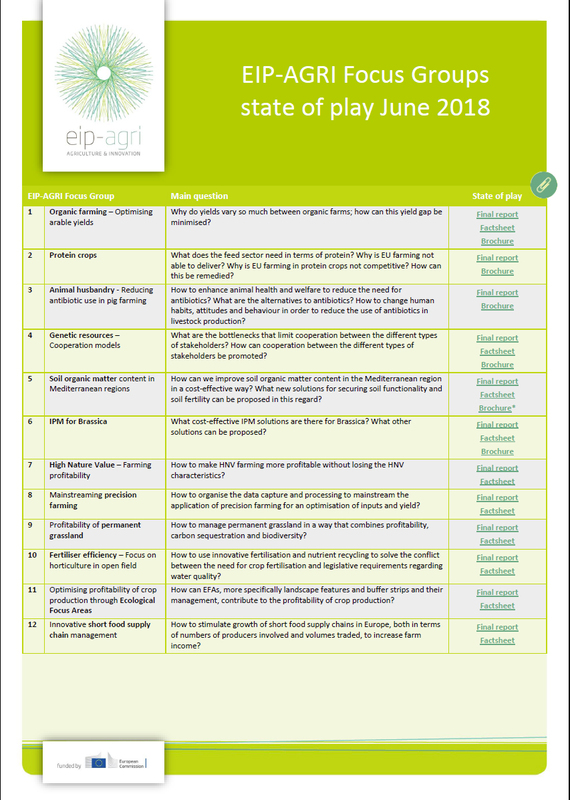 Take a look at the results that have been produced by EIP-AGRI Focus Groups so far in this overview (update March 2019). Each group explores practical innovative solutions to problems or opportunities in the field, and draws on experience derived from related useful projects. Each EIP-AGRI Focus Group meets twice and produces a recommendations and outcomes report. The EIP-AGRI Focus Groups also discuss and document research results, best practices and identify the implications for further research activities that will help to solve practical problems in the sector. These may be related to production, processing, consumption, transport or other issues. Highlighting priorities for innovative actions by suggesting potential practical Operational Groups or other project formats to test solutions and opportunities, including ways to disseminate the practical knowledge gathered. Do you have an idea for an EIP-AGRI Focus Group? Is the topic focused and the question well defined? Then why not suggest a new EIP-AGRI Focus Group topic.